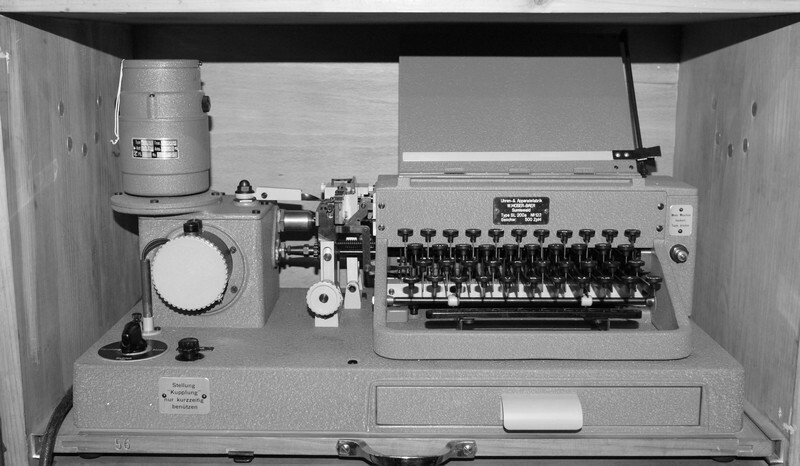 In the fourties, an automatic high speed telegraphy transmitter, which was used by the Swiss Army for morse code training purposes, has been produced by Moser Baer, Sumiswald. The precision mechanics company Moser Baer does still exist nowadays, today the precision mechanics and eletronics company Mobatec and Mobatec, who do produce the famous Swiss railways clocks are the successors of the original company. 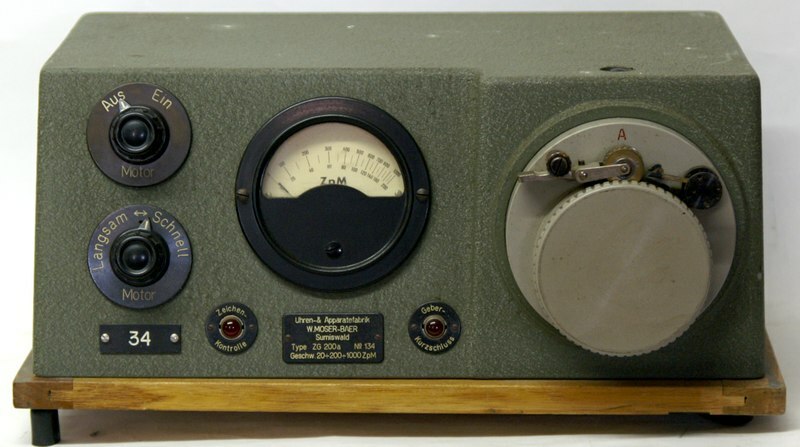 The high speed telegraphy transmitting system "Sendegarnitur SU-ZG-SL 200a", the crates are marked "AMS", has been developed by the clock maker Moser-Baer, Sumiswald. All units have designations with a small letter "a" at the end. The system has been used for morse code practise with the signal units of the Swiss Army in the fourties. The keyboard perforator SL 200a, which comes in a separate crate (48,5 kg with accessories) and is powered from the power supply with 110 Volts AC, a punched paper tape with the text message is generated. The motor runs with constant speed, the transport head moves the paper tape at constant speed and the punching head punches the transport holes and the holes for the morse code characters. On the paper tape, there are transport holes in the middle, these are generated, when the space key for a space between two words is depressed. Two holes on both sides of the transport hole in the middle code for a dot and two diagonal holes code for a dash in morse code. The punched paper tape is inserted in the transmitting head of the transmitting unit, so that the first hole of a line is on top and the second hole is below the transport holes; the operating instructions recommend to mark the beginning of the paper tape with an arrow. The punched paper tape is transported through the transmitting head. The polarised telegraph relay will close the circuit, when the rear contact pin in the transmitting head will give contact, and it will open the circuit, when the front contact pin makes contact (because there are two opposite holes coding a dot). In case of a dash with two diagnonal holes, the circuit is closed when the rear pin makes contact, the paper tape will be transported one step until the front pin makes contact and the circuit is opened, so a longer signal (a morse code "dash") is generated. The transmitter ZG 200a can be equipped with two different transmitting heads. Transmitting head A is used for morse code practise with 20 - 200 CpM speed and transmitting head B was intended to be used for high speed telegraphy with speeds of 100 - 1000 ZpM. The transmitting speed can be regulated at the transmitter unit ZG 200a. 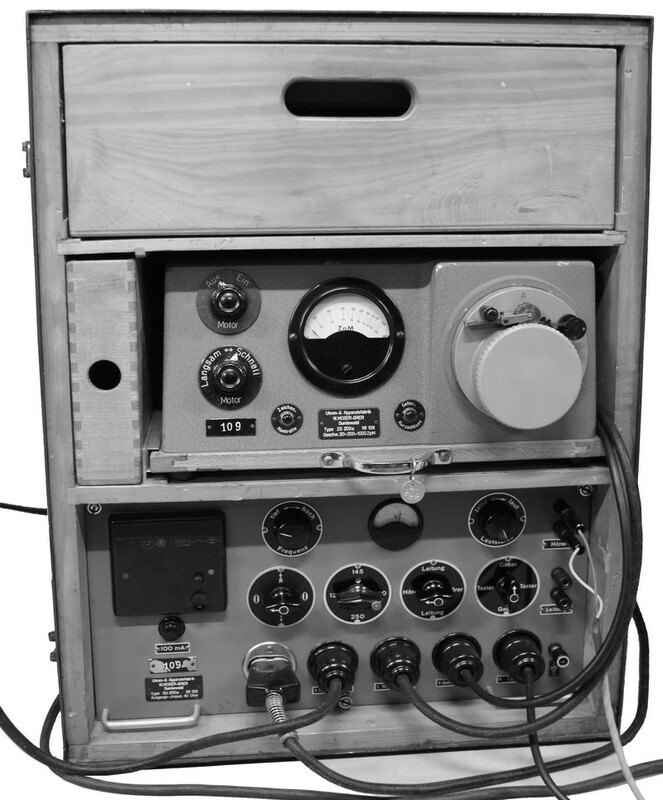 The transmitter Unit and the power supply unit SU 200a, in which the necessary voltage of 110 Volts is generated, are both installed in a bukky and heavy (43,5 kg) wooden crate. Switches in the SU 200a can be used to feed the signal from the automatic transmitter or from a manual morse key to the transmitter line. A signal of an audio generator (with a valve EL3) can be used to feed the headphones of the students if the system is used for morse code practise or a microphone input of a transmitter for modulated telegraphy A2 transmissions. I would be interested very much in additional information about where and how this equipment has been used. As far as I know, it was in use only for instruction and morse code lessons and not for "real" high speed telegraphy communications.